Whether you’re updating your home for comfort, safety, or to simply increase its resale value, it can cost a pretty penny. While experts say you can expect to recoup, on average, 56% of a renovation’s cost, the amount varies widely among projects. How long do you plan to stay in your home? If it’s less than five years, keep your renovation costs at a minimum. But, if it’s longer than five years, give more thought to what would make it more comfortable for you and your family. Spending a little more now and being able to enjoy it for a considerable amount of time in the future may justify a bigger budget. While you may recoup less of its cost, the value of your enjoyment is worth something, too. You don’t want to have the most expensive house in the hood, so a top-of-the-line kitchen in a modest neighborhood might be a mistake. While you want a quality remodel that improves the value of your home, it’s critical not to over-improve so that it significantly sets you apart from the rest of the neighborhood. Making a list of your wants and needs will help you decide where to spend your money. You should choose quality cabinets and appliances, but might think twice about a wine fridge. Is crown molding a must? Do you absolutely need a double oven and a warming drawer? Remember that buyers won’t pay extra for “niceties” so unless they’re important to the overall functionality of the kitchen, they may need to be closer to the bottom of your list. Your priorities list will also come in handy if you run into some unexpected expenses and need to revise some choices or remove some improvements from the project. In any home renovation, it’s critical to set a budget and stick to it. Remodels have the potential to cost more than you anticipated, but without a spending limit, you’re almost guaranteed to be overextended. As a general rule, labor will account for 20% of your project cost, Allow 35% for cabinets, 20% for appliances, and 5% for fixtures. The remaining 20% should be earmarked for other items, including unexpected issues that need to be resolved. To keep your budget as low as possible, you may be able to handle some of the prep work yourself. We’ve all seen Fixer Upper—there’s no reason you couldn’t remove the cabinets, pull up the floor, and remove the appliances instead of paying a contractor to do it. You’ll also want to keep a spreadsheet of all your expenses and check-in with the contractor regularly. While they should keep you informed of any overages, you don’t want to be caught off guard. Consider how you’ll pay for your kitchen remodel. You may have money in savings or might be thinking about a home equity loan. You might also consider refinancing your home or even applying for a personal loan. Whichever you decide, be sure to have the funds available at the start of the project. You’ll likely need to pay your contractor for materials and pay for labor as the project progresses. If your kitchen will be under construction, don’t forget to factor in the cost of eating out and maybe even another place to stay until the renovation is completed. 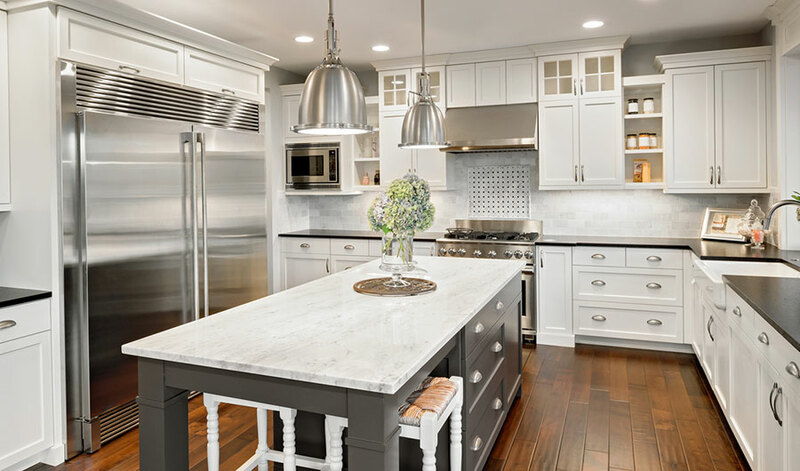 A kitchen renovation can bring new excitement into your home, but it can also be stressful. Create a budget, follow the plan, and closely monitor the project’s progress. In the end, you’ll have a kitchen that works for you and your family and the funds to comfortably afford it. If your home’s current market is worth more than the total amount of your remaining mortgage payments, then you’ve built up equity in your home. Many people who have equity in their homes are able to apply for home equity loans and use that portion of equity–or ownership–as collateral for the loan. Your combined loan-to-value ratio (CLTV) plays a critical role in the approval of an equity loan. Your CLTV ratio is the calculation of your current loan balance plus the additional equity loan amount divided by the appraised value of your home. Generally, lenders require your CLTV to be 85% or less. What type of home equity loan do you need? The traditional home equity loan offers the borrower a single lump sum to be repaid over a specific period of time, up to 30 years, at a fixed interest rate. Home equity loans are generally used for large expenses, like replacing a roof or paying off credit card debt, and are ideal for borrowers who need cash for a one-time event. It’s often referred to as a second mortgage, complete with closing costs and notarized signatures. A home equity line of credit (HELOC) is another type of home equity loan where the lender approves smaller sums of cash up to a fixed amount, similar to a credit card. Its flexibility allows the borrower to withdraw cash as needed and pay interest only on the amount that is withdrawn. Although repayment doesn’t begin until a predetermined date in the future, there is often an annual fee. HELOCs are ruled by adjustable interest rates, but they can be converted to a fixed rate loan once the repayment period begins. HELOCs are ideal for borrowers who need frequent access to cash to pay contractors during a remodel or even a recurring quarterly tuition bill. They also offer the benefit of not having to pay interest on the loan amount until it’s actually withdrawn. Regardless of the outstanding amount, the term, or the interest rate, a home equity loan or a HELOC is still a second mortgage. Just as in your first mortgage, the interest you pay is usually tax-deductible, to a certain limit, and rates are generally lower than you’d be charged on a credit card. You shouldn’t forget, however, that the second loan is secured by your home, which subjects your property to additional risk. You can be foreclosed upon if you’re unable to make your monthly mortgage payments. Be sure to treat your home equity loan or HELOC with just as much importance and seriousness as your first mortgage. Applying for a second mortgage could be a wise financial decision and a step forward in helping to organize your finances. Consider all of your options and consult with a financial advisor to see if a home equity loan might be a good fit for managing some of your larger expenses.